Prices may climb to $1,400 to $1,500 an ounce this year, said Ronald-Peter Stoeferle, managing partner at the Liechtenstein-based company, which oversees 100 million Swiss francs ($101.5 million). Spot bullion -- which was at $1,249 on Wednesday -- last traded at $1,400 in September 2013. Earlier this year, BNP Paribas SA -- the most accurate bullion forecaster in the final quarter of last year, according to Bloomberg rankings -- also sounded a note of caution. 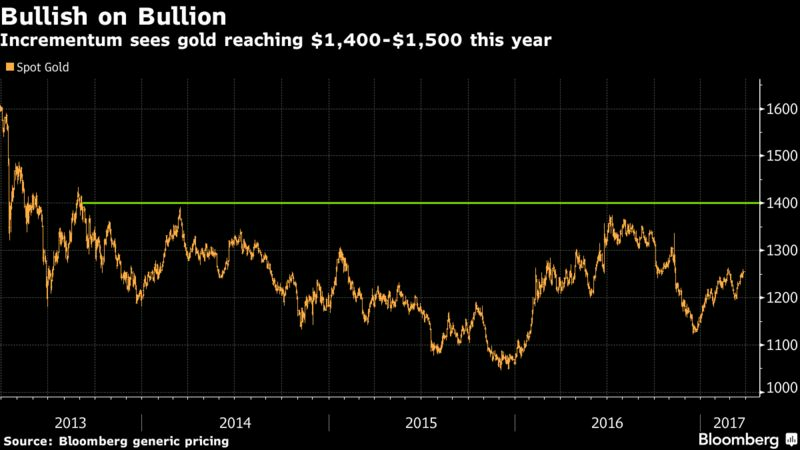 Bullion would probably decline as the Fed pursued rate hikes, keeping the dollar strong, the bank said in January. On Sunday, the OPEC/non-OPEC monitoring committee met in Kuwait and decided that they would keep observing supply and demand fundamentals for another month, a sign that there is still some indecision on which approach to adopt. This occurred despite growing consensus among participants of the agreement that an extension of the deal past its June expiry is desirable, especially to draw down inventories to their five-year average, which OPEC has said was the main objectives of this deal. Despite strong compliance from OPEC, the oil market has not responded bullishly as the rebound in US oil production has applied downward pressure on oil prices, threatening to undo its strategy of curbing output. In fact, oil prices are now back near $50/barrel, exactly where they were after OPEC and non-OPEC signed a landmark deal to cut production by around 1.8 million b/d. Prospects of further growth in US oil output have also changed the tide and analysts are questioning whether this will motivate a reassessment of the prevailing tactic. OPEC now faces a market that has significant doubts over the effectiveness of the output cuts. An increase in oil prices, is likely to cause an increase in shale [production], and analysts have noted that OPEC has to again choose between higher prices or market share. Russian energy minister Alexander Novak said his country had achieved 185,000 b/d in cuts, and assured it will cut to its commitment of 300,000 b/d by end-April. The compliance has been led by Saudi Arabia, which has cut 140,000 b/d more than it is required to under the deal, helping cover for less-compliant members. But the kingdom has made its displeasure with non-compliant participants known, and sources have told Platts that the kingdom may propose tighter conditions and possible ends to or limits on exemptions, for the deal to be extended past June. Saudi oil minister Khalid Al-Falih has been more circumspect about the need to extend the cuts and likely will be a linchpin in any policy decision, given Saudi Arabia's status as OPEC's largest producer. With oil prices marginally above $50/barrel on Monday morning, OPEC will have to tread carefully as oil market volatility persists amid stiff competition from US oil producers. Figures from the U.S. Department of Energy (DOE) show Cheniere's LNG export facility in Sabine Pass along the Louisiana-Texas border shipped 51.24 billion cubic feet (bcf) of LNG in the month. These volumes were carried on 15 separate vessel transits, some of which carried part-cargoes to multiple destinations. The January export figure surpassed the 41.8 bcf record set in December 2016, and came in the wake of the 2016 export total of 186.46 bcf compiled after the U.S. mainland's first export cargo sailed from Sabine Pass in February last year. Thanks to this total, vessel-borne U.S. LNG exports surpassed imports in 2016. Government forecasts call for the nation to become a net exporter of all natural gas by next year. Sabine Pass LNG export volumes are expected to grow as Cheniere's infrastructure is expanded. Two liquefaction plants, or trains in LNG parlance, are already on stream at the location. Cheniere has plans for six such trains at Sabine Pass, each with a nameplate LNG production capacity of approximately 4.5 million mt per year. Five trains are projected to be in operation by end-2019, according to Cheniere's regulatory filings. A commissioning cargo has already been produced from the third train, while the company recently filed regulatory paperwork on the fourth train which is expected to start producing in the second half of this year. Freeport LNG Development's terminal in Texas is expected to start exporting LNG next year. The company website gives its nominal export capacity as 13.9 million mt a year. Cheniere's Corpus Christi LNG export facility, with a nameplate capacity of 22.5 million mt per year, is expected to start in 2019, among at least three other projects scheduled for start-up stateside through 2021. Cheniere's pioneering year in 2016 has already put the company on a path out of financial wilderness. Three weeks ago, Cheniere announced a landmark fourth-quarter 2016 net profit of $85.35 million compared with the corresponding 2015 final-quarter net loss of $56 million. The bottom line benefited from the debut of the first two trains by September 2016, which saw 24 LNG cargoes head out of Sabine Pass in the fourth quarter. Cheniere's efforts illustrate the wider turnaround in the U.S. LNG shipping space. Imports were seen as a rising industry in the early 2000s, with the annual figure peaking at 770.81 bcf in 2007. Ship owners invested in tonnage while shoreside locations such as Sabine Pass did so with regasification equipment. As the shale gas revolution and 2008-2009 economic developments redefined the industry, Cheniere in 2011-2012 took the lead in developing liquefaction facilities adjacent to its regasification complex. Latest DOE figures show Sabine Pass LNG had been shipped to 19 nations by January. Mexico was the largest single importer with 41.48 bcf on 14 cargoes, including five in January alone. Other notable importers were Chile, Japan, China and India, as well as Jordan in the LNG-rich Middle East. LNG optimists believe in the future of U.S. exports, given the nation's shale resources and commitment to developing export infrastructure. Development cost overruns in Australia, a leading LNG exporter, and a moratorium in current world leader Qatar could make the U.S. the world's LNG supplier of choice, according to this view. However, Moody's said in a recent research note that it expects world LNG prices to "remain constrained beyond 2020 as a wave of fresh supply capacity comes online at a time when demand from the world's largest importers is weakening." Moody's said global LNG supply will swell 44% by 2020 to 455 million mt per annum on new construction projects in Australia, the U.S. and Russia, while the effects of the 2011 Japan tsunami and the subsequent nuclear shutdown will be on the wane. "Strong LNG demand growth from China, India and new markets will not be enough to absorb the fresh supply capacity coming online, particularly with demand falling in the largest importing countries, Japan and Korea. 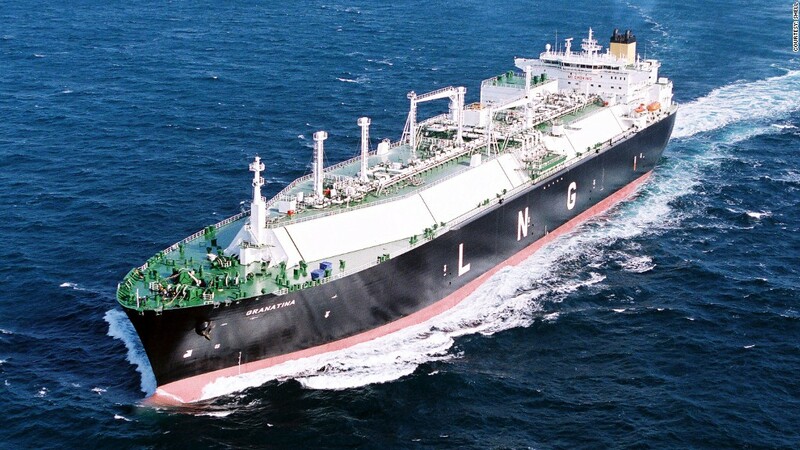 The market will not rebalance until the early years of the next decade, when global demand and LNG import infrastructure catches up with supply," said Tomas O'Loughlin, Moody's vice president and senior credit officer. According to Moody's, imports into Japan, which consumes over one-third of global LNG, will fall to 80 million mt per annum by 2020, a 9% reduction from its 2014 record, as nuclear power production slowly restarts. Demand from Korea, the world's second-largest consumer, will also be flat over this period, Moody's noted. "Until the market rebalances, investment returns for developers of Australian projects will be weak and U.S. LNG offtakers will struggle to recover all of their liquefaction costs," O'Loughlin added. Cheaper LNG from nearby Australia could make U.S. supplies unfeasible for Japan in this scenario, though the U.S. can still count on Mexico and possibly Europe to receive its exports. The Republic of the Marshall Islands (RMI) fleet now stands at 223,262,177 dwt, making it the second largest registry in the world in terms of deadweight tonnage, claimed International Registries and its affiliates (IRI). "This is a very significant milestone for the RMI Registry," said Bill Gallagher, President, IRI. "A strong legislative framework, customer driven service ethos, and a commitment to quality have all been key to our continued success." He added; "From long-standing traditional shipowners, particularly our standing as the number one flag for Greek owners, to a new wave of Chinese leasing companies, the RMI Registry is the registry of choice for owners looking for an innovative and quality driven partner." The RMI is not only the world's second largest registry, but also the Greek shipping industry's leading flag. The RMI has been gaining market share year-on-year and the flag currently has 791 ships totalling 62,190,301 dwt (over 18.9% of total dwt of the Greek owned fleet) in its registry, making it the largest flag used by Greek controlled ships. "Our office in Piraeus is the second largest of the RMI Registry's 27 worldwide offices," said Theo Xenakoudis, director, worldwide business operations and managing director of the Piraeus office. "Prior to registration, we vet the owner, operator and vessel before acceptance in the RMI Registry and during the vessel's time in the Registry we continue to conduct risk assessments and work with our owners and operators to ensure their vessels meet the Registry's quality standards," continued Xenakoudis. "This process along with our service oriented philosophy has ensured the RMI Registry has maintained its excellent reputation and as such has attracted quality owners, including the Greek owners to the RMI flag." "We are delighted that our Greek owners and operators continue to hold the RMI Registry in such high regard which has been reflected in the Greek Shipping Co-operation Committee's March, 2017 Greek Controlled Shipping Report which shows the RMI as the number one choice of flag for Greek owners and operators," he added. In another development, the RMI Registry has recently received preliminary confirmation that it will continue its US Coast Guard (USCG) Qualship 21 status for 2017. The announcement was made during Intertanko's North American Panel meeting, which met prior to the beginning of the Connecticut Maritime Association's (CMA's) Shipping 2017 conference in Stamford (Conn). "This is the 13th year in a row that the RMI Registry has held its Qualship 21 status," said Gallagher. "It's significant because this achievement is no easy undertaking for a major registry, whose ships make thousands of US port calls, to maintain less than a 1% detention rate on a three-year rolling average basis. "The Qualship 21 designation means that ships flying the RMI flag are less likely to be detained in US ports, which assists owners and operators in keeping their ships moving," he concluded. Meanwhile, the Liberian Registry said that it had passed the 150 mill gt milestone, confirming its position as the second largest ship registry in the world, behind Panama, in terms of numbers of ships and gross tonnage. This follows the registration of a bulk carrier, which was recognised at this week’s Connecticut Maritime Association’s annual Shipping Conference where Cameron Mackey, Scorpio Group COO accepted a ceremonial certificate of registry from Liberian Registry CEO, Scott Bergeron. A gas station worker pumps gas into a motorcycle as people wait in line to fill the tanks of their vehicles at a gas station of the state oil company PDVSA in Caracas, Venezuela, March 22, 2017. Grumbling Venezuelans were lining up for scarce gasoline across the OPEC nation on Wednesday, due to mounting oil industry woes in the country with the world's largest crude reserves. 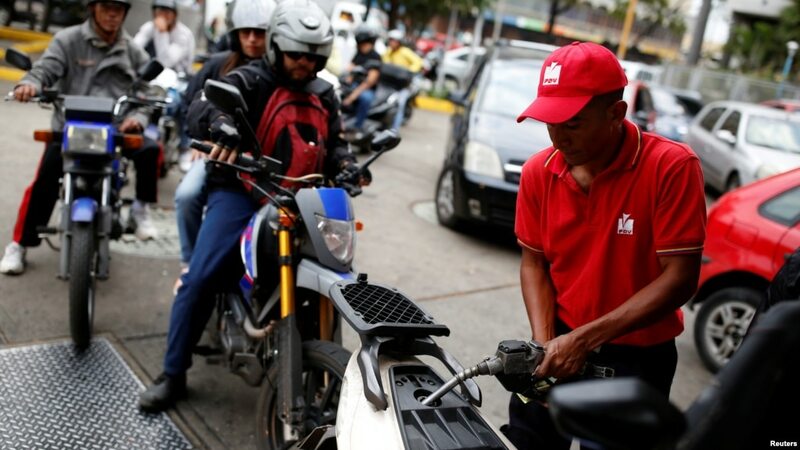 Venezuela, which also has the world's cheapest gasoline, has wrestled with intermittent gasoline shortages in recent months, especially in the central coastal area. Long lines were reported in capital Caracas, which is unusual, and the eastern city of Puerto Ordaz on Wednesday. Dozens of cars could be seen snaking into streets and some service stations were shuttered. "I can't find 95 octane gasoline anywhere. And we're an oil-producing country! It's pathetic," said Jose Paredes in Caracas' wealthy Altamira district. People wait in line to fill the tanks of their cars at a gas station of the state oil company PDVSA in Caracas, Venezuela, March 22, 2017. The waits heap extra hardship on the nation of 30 million, where many already jostle for hours in hot lines for food and medicines amid product shortages caused by a brutal economic crisis under leftist president Nicolas Maduro. 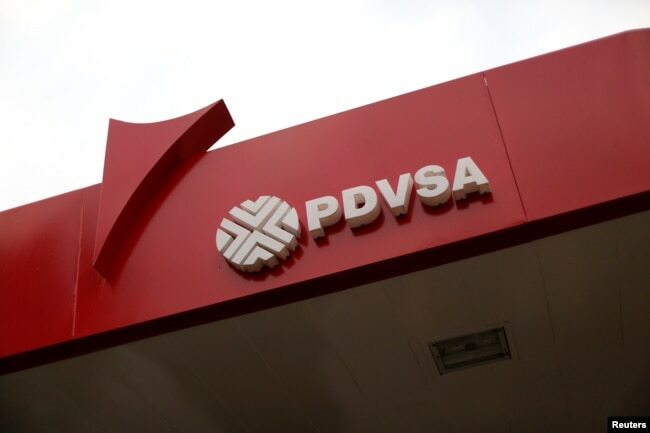 State oil company PDVSA's new head of trading blamed the shortages on problems with internal shipping of products and vowed the issue would be solved soon. "We're strengthening deliveries to the center of the country to stabilize gasoline supplies," Ysmel Serrano tweeted. 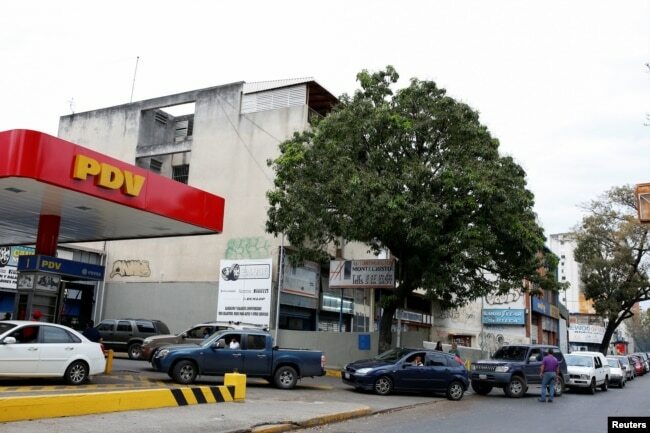 The gasoline shortage comes as new top executives are appointed at PDVSA, largely from political and military quarters, and increasing problems in Venezuela's oil industry. As of March 22, about a dozen tankers were waiting around PDVSA ports in Venezuela and the Caribbean to discharge refined products, components, and diluents crucial for oil blending, Reuters vessel tracking data showed. The corporate logo of the state oil company PDVSA is seen at a gas station in Caracas, Venezuela, March 22, 2017. Backlogs and payment delays to PDVSA's suppliers, which are now demanding to be prepaid, sometimes mean shippers wait weeks to deliver oil products. And many tankers are idle because PDVSA cannot pay for hull cleaning, inspections, and other port services, according to internal documents and Reuters data. Union leader Ivan Freites, a PDVSA critic, said Venezuelan refineries, which have been at around half capacity for months amid outages, only had oil inventories for around two days versus a standard of 15. "To solve this immediately, we would need deliveries from at least 10 tankers," he said. In Venezuela's industrial city of Puerto Ordaz, the problem has been increasing this week and National Guard soldiers were trying to maintain order at operational service stations. "We've been working extra hours, opening before 6 a.m and closing after 11 p.m. because of the lines," said Caura service station manager Felix Rodriguez, tired and with blood-shot eyes, adding he had not been given a reason for the slow deliveries. Total shale oil production was expected to rise 109,000 barrels per day to 4.96 million bpd, according to the U.S. Energy Information Administration’s drilling productivity report. Oil production in the Permian Basin in Texas and New Mexico, the largest U.S. shale oil field, was set to rise 79,000 bpd to 2.29 million bpd, the highest level on records dating back to 2007. In the Eagle Ford region in Texas, output was expected to grow nearly 28,000 bpd to 1.14 million bpd, the highest level since November. Production in the Bakken, however, was set to drop 10,000 bpd to 964,000 bpd, the only month-on-month decline across all seven basins used in the report. That would be the third consecutive monthly decline in the North Dakota basin. Meanwhile, U.S. natural gas production was projected to increase to a record high 49.6 billion cubic feet per day in April, the EIA said. That would be up almost 0.6 bcfd from March and would be the fourth monthly increase in a row. The EIA projected gas output would increase in all of the big shale basins in April, including the Eagle Ford, where production had been declining since January 2016. Output in the Marcellus formation in Pennsylvania and West Virginia, meanwhile, was set to grow by almost 0.2 bcfd to a record high near 19.2 bcfd in April, a sixth consecutive increase. EIA also said producers drilled 807 wells and completed 716 in the biggest shale basins in February, leaving total drilled but uncompleted wells (DUCs) up 91 at 5,443, the most since April 2016. TransCanada Corporation has announced plans to add 6.2 million barrels of new crude oil storage at its Cushing terminal in Oklahoma. The new storage will be owned by M2 Infrastructure and operated by TransCanada. Under the terms of the memorandum of understanding, M2 has an option to build up to 20 million barrels of storage, which would be built in subsequent phases. The project and option to expand are subject to completion of definitive agreements between the parties as well as acquiring the required approvals and land rights. Construction of the crude storage is expected to start in late 2017. M2 will work with Matrix Global Holdings to sell storage capacity to its customers through on-line auctions for futures contracts and/or physical forward agreements. NOC chairman, Mustafa Sanalla, met with the Chinese Ambassador to Libya, Li Zhiguo, and a number of senior officials of UNIPEC, a unit of China’s state-run firm Sinopec Group. During the meeting the progress of current contracts between NOC and the company were discussed. The parties also discussed Chinese firms returning to Libya’s oil sector to resume activities. At the end of the meeting, the Ambassador of China invited Sanalla to officially visit the People’s Republic of China to meet with the senior officials in the Chinese oil sector in order to develop the Libyan-Chinese oil relationships. April WTI (West Texas Intermediate) crude oil (USL) (SCO) (VDE) futures contracts rose 2.4% and settled at $48.86 per barrel on March 15, 2017. Broader markets (SPY) (SPX-INDEX) also rose 0.8% to 238.9 on March 15, 2017. Oil and gas are major parts of the energy sector. The energy sector contributed to ~6.5% of the S&P 500 as of March 10, 2017. The US dollar (UUP) fell 1% to 100.6 on the same day. The US dollar already priced in the rate hike. The fall in the dollar supported oil prices on March 15, 2017. However, crude oil (XLE) (IXC) (IEZ) futures are trading near a three-month low due to the rise in Saudi Arabia’s crude oil production. Meanwhile, the EIA (U.S. Energy Information Administration) released its weekly crude oil inventory report on March 15, 2017. Prices rose due to the factors mentioned above. However, the recovery in crude oil prices would be short-lived due to the following data from the inventory report. The Crude Oil Volatility Index fell 9.4% to 30.1 on March 15, 2017. It hit 24.7 on March 1, 2017—the lowest level since October 2014. High crude oil volatility in March 2017 suggests more downfall for crude oil prices. Volatility in crude oil prices can impact oil and gas producers’ earnings like Hess (HES), ExxonMobil (XOM), Warren Resources (WRES), and Goodrich Petroleum (GDP). Welcome to the Snapshot a series that examines the factors driving and shaping global commodity markets today. Brent crude prices have traded between $54/b and $56/b for an extended period of time because of the great uncertainty in the fundamentals. The market is particularly well supplied as far as sweet crude grades are concerned and an increase in imports coming from Libya and West Africa helped keeping Brent prices low. The availability of sweet crude was so relevant that prices did not soar despite a rather good Asian appetite for North Sea crude grades; Brent, Forties and Ekofisk above all. On the physical side, it looks like a lot of current available cargoes will actually be destined to satisfy Asian demand. Globally, the increased US shale oil production has largely counterbalanced the drop in OPEC output and OPEC Secretary General Mohammed Barkindo has recently stated that non-OPEC countries, which pledged to wipe out some 600,000 b/d from the market, will need more time to comply with the mutually agreed production cuts. Moreover, Russia managed to curb “only” 117,000 b/d in the month of January but its energy minister Alexander Novak has recently said the 300,000 b/d cut promised by Moscow will be achieved by May. As far as market risk is concerned, it is important to point out Dated Brent’s monthly volatility is still trading around its two-year low. Furthermore, the 2 months volatility curve is now overlapping the monthly one creating a partial contraction process which implies that more market instability should be expected in following weeks. The mixed signals coming from the Brent market are even more evident in the “physical vs paper” analysis. ICE Brent futures’ fluctuation rate, at the end of February, dropped to 17.67% meaning that it was 5.48 points lower than Dated Brent’s volatility. This divergence is rather unusual for two reasons: Brent futures’ volatility tends to be consistently higher than Dated Brent’s one and the actual deviation is almost its widest since January 2014. Actually, also Brent futures’ monthly volatility has now touched its lowest level in 2 years and it is crucial to note that each time Brent futures’ fluctuation rate has been around the current levels the market has experienced a retracement. The mean reverting pressure of volatility is very high at this point and the outlook on Brent prices remains negative because the oscillation rate, now that the divergence between physical and paper market has reached a very high level, should go up in coming weeks. The probability distribution analysis shows that Brent’s volatility, at the end of February, was within the 20%-25% range but the chances for it to remain within that interval are as low as 5.12%. The fluctuation rate is more likely to move towards the 25%-30% volatility interval, almost 13% chance, but the probability to reach the 30%-35% range is even higher than 23%. The volatility cones analysis is again displaying an extreme scenario: the monthly and bimonthly volatility figures are the ones showing the largest divergence as compared to the medium range one implying that the largest spikes in volatility could extend to more than just four weeks, everything else being equal. The risk profile priced into the remaining part of the current volatility curve is actually lower but market participants are expecting a good amount of market volatility in the near future. Overall, the outlook on both physical and Brent futures prices remains negative. Until next time on the Snapshot—we’ll be keeping an eye on the markets. It was a rough week for the crude oil market. After months of relative price stability, with WTI oil prices pinned between $50 and $55 per barrel, the floodgates of selling opened wide, as the record amount of long positions that was built up by speculators over the preceding weeks was, quite obviously, liquidated, as evidenced by sky-high volume in both futures and option contracts. There were several catalysts: Crude oil inventories in the United States hit a new, record level, according the Department of Energy's weekly status report, which also showed U.S. oil production rebounding to within five percent of last year's record to nearly 9.1 million barrels per day. Of course, the steadily rising oil rig count indicates that even more production is on the way, and it is not impossible to foresee overall production rising toward 10 million barrels per day over the course of the next 12 months. There was also a large gathering of global energy interests in Houston, Texas this week that included officials from several OPEC countries and Russia. Statements by Saudi Arabia's oil minister and OPEC's Secretary General were hardly reassuring about them continuing the current production limiting accord, after June 30, when it is set to expire. The Saudi oil minister explicitly said that the accord adherents would not abide "free-riders," which is how he referenced the shale producers, in particular. Apparently, sideline discussions among this disparate group was even more pointed. The production deal has been shouldered almost entirely by Saudi Arabia. If you take out their over-compliance, the OPEC compliance rate with the cutbacks is under 50%. Up until this week, rosy rhetoric about limiting output from OPEC and Russia, among others, lifted prices and kept them elevated. At one point, a run at $60 per barrel looked possible, if not likely. Not anymore. It is natural to think that the renewed sell-off would harden the resolve of producers to limit production, and restore the market balance, but that looks increasingly unlikely. "Statements by Saudi Arabia's oil minister and OPEC's Secretary General were hardly reassuring about them continuing the current production limiting accord, after June 30, when it is set to expire." Saudi Arabia's patience has been tried, and they have come to realize that their efforts have only served to resuscitate the U.S. shale competition, which is increasingly taking the battle for global market share to OPEC by ramping up exports that have at times exceeded 1 million barrels per day. In response, Saudi Arabia announced that it would, once again, supply full contract volumes of crude oil to its Asian customers, and it has aggressively discounted its pricing. In truth, the most effective strategy for Saudi Arabia, in terms of dealing with competitive threats, is to exploit its position as the low-cost producer (by a lot) and flood the market with oil. The price crash last year was a result of unbridled production by OPEC members, when the quota system was scrapped. It sent a shudder through the energy market and wreaked havoc on the U.S. shale industry. The U.S. rig count fell by more than two-thirds from its 2015 peak, but has since recovered. The Saudis have done this in the past. In 1998, they sought to teach Venezuela a lesson about competing for market share. They cratered prices, but not only did the kingdom squash Venezuela, U.S. oil production was gutted, and it did not recover, until the nearly decade long oil price close to $100 per barrel spurred the tight oil or fracking revolution and the ensuing rebound in output. This could get ugly, again, for oil producers, especially if the OPEC-NOPEC production accord is scrapped. With U.S. refiners undergoing seasonal maintenance right now, U.S. oil inventory levels will only grow further, until the units return to service, in the coming weeks. Prices for WTI will likely fall steadily back to the November lows near $42 per barrel over the next few weeks. The real test comes after that. Could we retrace the entirety of the gains off the February 2016 low at $26.05? It is quite possible. If the Saudis won't abide free-riders, then they need to act against them. While it is painful to all concerned to undertake a price war, you can bet the lowest cost producers will be the last ones standing. Commentary by John Kilduff, a partner at Again Capital, an investment-management firm that specializes in commodities. Follow him on Twitter @KilduffReport. Feb 27 TransCanada Corp has offered to sell stakes in two U.S. natural gas pipelines to fund other projects including its recently purchased Columbia natural gas network, the Calgary-based company said on Monday. The move comes after TransCanada, Canada’s No. 2 pipeline operator, sold other assets and offered new shares late last year to help fund its $10.3-billion acquisition of the Columbia Pipeline Group, a deal that eased concerns over its outlook, which had been hindered by challenges on crude pipelines. TransCanada said it would sell its 49.3 percent stake in the Iroquois system and its remaining 11.8 percent stake in the Portland system, both serving the U.S. Northeast, to TC PipeLines LP, a partnership in which it holds a 27-percent stake. Financial terms were not disclosed, but a 25.9 percent stake in Iroquois system sold for $286.5 million in 2015, and TransCanada last year sold a 49.9 percent stake in the Portland pipeline to TC PipeLines for $223 million. “This offer demonstrates the meaningful role that TC PipeLines, LP can fulfill in funding a portion of our C$23 billion near-term capital program,” TransCanada Chief Executive Russ Girling said in a statement. According to TransCanada, its near-term projects also include the Nova Gas Transmission Ltd and Canadian Mainline natural gas systems, minor crude pipelines and power generation projects in Canada and gas pipelines in Mexico. TransCanada’s outlook has been clouded by regulatory challenges to two proposed pipelines projects from Canada’s oil heartland of Alberta, Energy East to the East Coast and Keystone XL to the Gulf. While the United States under President Donald Trump has been favorable toward Keystone XL, analysts have said it was unclear how quickly the pipeline could go ahead if approved. TC PipeLines said the offer was subject to approval by its board of directors. The Iroquois pipeline extends from the TransCanada Mainline system at the U.S. border near New York to markets in the U.S. Northeast. The Portland pipeline connects with the TransQuebec and Maritimes pipelines at the Canadian border and the Tennessee gas system near Boston. Another week, another record for U.S. crude exports. Producers and traders shipped out 1.21 MMbopd from the U.S. in the week that ended February 17, the most in Energy Information Administration data going back to 1993. Domestic output increased to 9 MMbopd last week, the fastest pace since April, while U.S. refiners used the least crude since October 2015. Shale output has surged and tankers loaded in the Middle East during the last days of all-out production by OPEC nations arrived this month in the U.S., swelling stockpiles to a record. Prices for West Texas Intermediate crude have averaged $2.24/bbl below global marker Brent this year, making U.S. oil more attractive to refiners around the world. For now, U.S. crude is looking especially attractive to buyers in Asia. WTI has averaged 22 cents below Dubai, a lower-quality grade that’s the benchmark for Asia, this year, based on front-month swaps data from broker PVM Oil Associates Ltd.. That compares to a $3.76 premium a year ago. 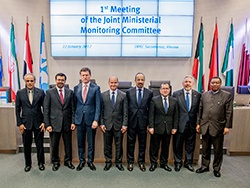 OPEC has met 98.5% of its total combined cuts from the 10 member countries participating. Members moved closer to full compliance in meeting their production cut agreement signed in December last year, as output in February fell from January levels to average 32.03 million bpd, according to the S&P Global Platts survey. Under the agreement, OPEC pledged to cut 1.2 million bpd for six months and freeze production at around 32.5 million bpd, including Indonesia, which suspended its membership in November and is not included in the Platts survey estimates for 2017. OPEC as a whole averaged 32.11 million bpd in January and February, according to the survey. Adding in Indonesia’s typical 730,000 bpd of production would take the producer group about 340,000 bpd above its ceiling. There are also 11 non-OPEC countries that are participating in the production cuts. The non-OPEC countries, led by Russia, have agreed to dial back production by a combined total of 558,000 bpd. Prosecutors in Milan believe that $800m, the alleged proceeds of the controversial OPL 245 oil deal involving oil giants Shell and Eni and former Nigerian petroleum minister Dan Etete, was transferred to two Nigerian banks through J.P. Morgan in London. Italian prosecutor Fabio de Pasquale, who has led a team investigating the scandalous oil deal for over two years, discovered that the transfer was made in two separate payments of $400m. Over $400m was converted into cash while tens of millions was used to purchase a private jet and armored cars in the US, according to documents compiled by the prosecutors. Mr. de Pasquale’s discovery came after carrying out raids of Eni’s offices in Italy and Shell’s headquarters in the Netherlands, which turned up thousands of documents and emails pertaining to the scandal. He subsequently requested that an Italian court charge ten individuals, five of whom are high-ranking Eni executives, implicated in the deal. The prosecutor also warned four Shell executives, including former MI6 employees Guy Colegate and John Copleston, that they could be charged to court. According to Mr. de Pasquale, before working at Shell, Mr. Copleston served as the UK’s intelligence representative in Nigeria, while Mr. Colegate worked as a “business advisor” for the MI6 and was tasked with briefing the intelligence agency on the OPL 245 oil block deal. It would be recalled that the oil-rich OPL 245 block in Nigeria was sold to Malabu Oil and Gas in 1998 by then petroleum minister Dan Etete, who, it was later revealed, owned a significant stake in the company. In 2011, it was sold to Shell and Eni for $1.3b, which was paid to the Nigerian government so that no direct deal would be made with Malabu or Dan Etete, who was officially recognized as a criminal due to his past convictions of money laundering. The Nigerian government then placed $1.1b in an account with J.P. Morgan in London and directed the bank to transfer the money to a Swiss bank account allegedly linked to Mr. Etete and Malabu. The transfer was rejected, however, due to Mr. Etete’s connection with the funds. A second attempt to transfer the sum to Mr. Etete was made through a Lebanese bank, which was also rejected. J.P Morgan finally transferred $800m in two tranches to two separate Nigerian banks. Italian prosecutors have accused Shell and Eni of knowing that the money paid to the Nigerian government would go to Dan Etete and Malabu oil, although the oil giants have denied these allegations. Some very quiet days were noted last week with VLCC tonnage building up in the MEG, leaving multiple choices for charterers. Inevitably, rates dropped sharply MEG/East, which also pulled WAfrica/East down accordingly, Fearnleys reported. VLCC earnings dipped below $20,000 per day, and only a sharp increase in volumes in all areas will avoid rates remaining under pressure, as the spring months advance. Suezmaxes in West Africa saw steady activity but most fixing was undertaken under the radar. There was an element of doubt as to the actual market direction. The position lists gradually began to tighten and as this week has progressed, we have seen sentiment building as owners sense charterers are facing a different scenario in the early third decade, Fearnleys said. Td20 earnings were closing in on $15,000 per day at WS85 levels. The Med and Black Sea market was more transparent over the past week with a steady feel. Enquiry for longer tonne/mile voyages going east picked up but didn’t prove enough to move rates on the standard cross-Med routes. Charterers are currently seeing owners trying to force rates up but patience will be the key to hold rates in check. North Sea and Baltic looked tighter for Aframaxes, and owners started to hold back and push for higher rates, which was mainly caused by a huge 71 crude cargoes quoting ex Baltic in March. In addition, several ice class vessels were repositioning to the Med and furthermore, there were a lot of East enquiry for fuel as the arb opened. In the Med and Black Sea the market was described as being in limbo. All the fundamentals for the market to firm up were present, as the Turkish Straits were frequently closed, Black Sea programme was quite busy and the tonnage list looked thinner. However, one factor outlined the difference between firm and soft, and that was oil company relets willing to fix at competitive rates. That being said, we do believe this market have the potential to firm in the near future as both Novo and CPC will be quite busy cargo wise, Fearnleys concluded. Meanwhile, VLCC rates on the AG/Japan route tumbled by nearly WS10 points within a day to WS60 on Tuesday of this week, after news of S-Oil placing ‘Australis’ on subs for an AG/Onsan run at WS54.75, loading 13th-15th March basis 274,000 tonnes, broke, Ocean Freight Exchange (OFE) reported. Other charterers followed, with at least four older vessels fixed within the range of WS55-WS58 for an AG/East voyage. Upcoming Asian refinery maintenance over the next two months is unusually heavy and is expected to lower March cargo flows out of the AG, weighing on VLCC rates. At least 2 mill barrels per day of refining capacity East of Suez is expected to be offline in March, more than double that of last year. China’s state-owned refiners account for around 50% of overall capacity closures in Asia in March, which will reduce AG-loading cargo volumes, as they form the core of Saudi Aramco’s client base. The unwinding of storage plays has begun, as floating storage becomes less economically viable, due to the flattening Brent futures curve. According to Reuters, 12.1 mill barrels of crude (equivalent to six VLCCs) were released from floating storage in Malaysia, Singapore and Indonesia. The influx of tonnage will further push down freight rates. Moreover, some of the vessels previously chartered for floating storage are older units, which are typically available at discounted rates, OFE said. The overall impact of OPEC’s production cuts (~1.2 mill barrels per day) is evident from the fall in VLCC fixtures from the AG, which were estimated to have dropped by 9% month-on-month to 145 in February. According to OPEC, compliance reached over 90% in January with Saudi Arabia shouldering the bulk of the agreed cuts, OFE concluded. As mentioned elsewhere in this news roundup, Frontline is to buy two VLCC resales from Daewoo Shipbuilding & Marine Engineering (DSME) for $77.5 mill each. They are scheduled for delivery in September and October, 2017, respectively. Elsewhere, Nordic American Tankers (NAT) took delivery of the newbuilding Suezmax ‘Nordic Space’ on 27th February. She is NAT’s second Suezmax newbuilding delivered by Sungdong Shipbuilding and Marine Engineering. This brings NAT’s fleet up to 33 Suezmaxes, which includes three newbuildings to be delivered during the second half of 2018. KNOT Offshore Partners (KNOP) has completed the acquisition of the ownership interests in the company that owns and operates the shuttle tanker ‘Tordis Knutsen’ for an aggregate purchase price of $147 mill less $137.5 mill of outstanding debt, plus about $21.1 mill for a receivable owed by Knutsen NYK to KNOT 24 and around $0.8 mill for certain capitalised fees related to the financing of the vessel. ‘Tordis Knutsen’ is a 156,559 dwt shuttle tanker, built by Hyundai Heavy Industries and delivered in November, 2016. She is operating in Brazil under a five-year time charter with a subsidiary of Royal Dutch Shell, which will expire in the first quarter of 2022. The charterer has options to extend the charter for two further five-year periods. Meanwhile, the only newbuilding reported recently was Central Mare’s declaration of an option to construct a second MR at Hyundai Vinashin for a reported $32.5 mill. In another newbuilding sale, the ‘Gener8 Nestor’ was committed to unknown interests for $80 mill subject to the signing of a five year charter to Unipec. She is due for delivery this year from HIC Philippines. The 2006-built LR1 ‘New York Star’ was believed committed to US-based Norstar Shipping for $14.5 mill. In the charter market, brokers reported that the 2004-built Suezmax ‘Valtamed’ was fixed to Petraco for six, option six months at $28,000 per day. STI was said to have taken the LR2s ‘FPMC P Ideal’ and the ‘Densa Alligator’ for six months each at $14,000 and $14,500, respectively with the latter having an option for a further six months at $15,000 per day. In the MR segment, ATC was thought to have fixed the 2013-built ‘Nave Orion’ for 12 months at $13,250 per day and Hpel was believed to have fixed the 2000-built ‘Prem Malta’ for 12 months at $12,750 per day. Oil prices slipped on Tuesday but kept trading in a tight range, as concerns about rising U.S. crude inventories ahead of data overshadowed OPEC production cuts. U.S. crude stockpiles have risen for seven straight weeks. Forecasts for another weekly build, this time of 3.1 million barrels last week, fueled worries that demand growth may not be sufficient to soak up the global crude oil glut. "There's a risk that some of the new longs will start to head for the exits, and that's where we could see a correction." The market shrugged off a report Tuesday afternoon that showed U.S. crude production had contracted in December. [EIA/PSM] The market has been looking to the weekly rig count report for a more timely picture of U.S. crude production. Members of the Organization of the Petroleum Exporting Countries must lower production costs to compete better with shale producers, Nigeria's oil minister said on Wednesday. Emmanuel Ibe Kachikwu, in an interview with CNBC Africa, also said he was confident that an output reduction agreement agreed in November would see oil prices hold. Nigeria, which relies on crude sales for around two-thirds of government revenue, saw its economy shrink 1.5 percent in 2016 - the first full-year contraction in 25 years - largely due to lower oil receipts. Eleven of OPEC's 13 members along with 11 non-OPEC countries agreed to make cuts for the first half of 2017, although Nigeria and fellow OPEC member Libya were exempt due to production setbacks suffered last year. "OPEC members must lower production costs to compete better with shale producers," said Kachikwu, quoted in a tweet on CNBC Africa's Twitter feed. Kachikwu said he was "impressed with the work OPEC has done" and "confident prices will hold", but added: "What is more fundamental is what OPEC countries can begin to do for themselves in term of costs, diversification." The Nov. 30 agreement to cut production prompted oil prices to rise $10 a barrel, although they have been trading in a narrow $3 range in the last few weeks. But analysts say that a revival in U.S. shale production is likely to limit any major price recovery in crude oil.